Incredible views of Kanjirowa Himal, Crystal Mountain and many more. Thrilling high passes; Kang La, Saldang La etc. Discover Wild West of Nepal Himalaya. Breath stopping Gorges and the colourful Monasteries. Upper Dolpo Trekking Trail is a remote and unspoiled area near the Tibetan boarder of Nepal. It was opened for foreign trekkers only in the late eighties. Upper Dolpo is famous for the rarely found animals like snow leopards and blue sheep. Upper Dolpo trekking trail is one of the most isolated trail in Nepal which is rich in beautiful scenario of forests, waterfalls, rivers and the giant White Mountains. Upper Dolpo is located beyond the Dhaulagiri Himalayan rain shadow area, which is one of the most remote area of Nepal. Peoples from different ethnic groups and their traditions and culture can be explored throughout the trail. Nepal’s first English Subtitled and Oscar nominated movie – Caravan was also shot in this region. The ancient traditions and culture can be observed here without any effect of western culture. Pure Tibetan culture can be seen. It is one of the restricted trekking area of Nepal and a special permit is required to visit this site. The individual trekker won’t get permission for this trek, there must be at least two person to get the permission from the trekking permit immigration. Although it is least developed district of the country, it is rich in natural beauties. The deepest Lake of Nepal Shey Phoksundo lies in this area, having the depth 145m. The old Buddhists Gompas, pristine lakes, soaring peaks and people’s lifestyle of least developed region are the other attraction of the trail. Here, most of the peoples speaks Tibetan language, only the very few can understand Nepali language. The trek starts with a short flight from Tribhuwan International Airport (Kathmandu) to Nepalgunj and next morning flight ending at Jhupal. The best season for this trek is summer and Monsoon. Because of the heavy snowfall, winter season is avoided for this trek. This trek would be your lifetime memory of adventurous journey. You will be warmly welcomed by our representative at Tribhuwan International Airport and transferred to Hotel. There will be short briefing in the hotel. You can relax your leisure time in hotel. Overnight stay in Kathmandu. After a short flight from Kathmandu, we will reach to Nepalgunj which is located in south western part of Nepal. Peoples from different parts of the country lives here which makes it rich in culture and heritage. There is a Bageshwori Temple which is Nepal’s one of the important Hindu Temple. Overnight stay in Nepalgunj. Included Meals: Breakfast, Lunch, and Dinner. After 35 minutes flight from Nepalgunj, we reach Jhupal. We can enjoy the beautiful views of snow-capped mountains during the flight. Jhupal is a small mountain village which is colder than birgunj. We will stay overnight in Jhupal. From Jhupal, we will descend through wheat and vegetables field and reach Thuli Bheri River, where we will pass through a long suspension bridge to reach the entrance of Shey Phoksundo National Park, Nepal’s largest National Park with having the total area 3,555kmsq. It comprises the Trans Himalayan ecosystem and Tibetan type of floras and faunas. Tourists rather than from SAARC country have to pay 1000NPR for entrance. Enjoying the good view of Dhaulagiri range, we pass through the fir, juniper, Cyprus and bamboo forest. At the end of the day, we will reach Chepka, a small village surrounded by millet and wheat fields. Overnight stay in Chhepka. Day 05: Chepka to Palma [3820m]: 6-7hrs walk. We will pass through the beautiful forest following a river. The trail is both ascending and descending. On the way we can see local peoples with their dzopas (cross breed of Yak and Cow). Loaded with things to sell. After some ascents and descents and passing several villages, we will reach our today’s destination- Palma. Where we stay overnight. About 4 hours walk from Palma takes us to Phoksundo lake. After 2 hours climb from palma we reach to Nepal’s highest waterfall, a spectacular waterfall of 107m height known as Phoksundo waterfall and also called sunlight waterfall. Then we descend and reach Ringmo village which is beautiful small village. People living here practice Bonpo religion which is related to Buddhist but was originated many years before Buddhism. Overnight stay in Ringmo. Today we will explore Phoksundo Lake and the relilgions and culture of Buddhist and the ancient Bonpo Culture peoples. Today is also rest day for our long walk. Overnight stay in Ringmo. Day 08: Trek to Sallaghari [3640m]: 5-6 hours walk. We will enter the restricted area of Upper Dolpo today. We will follow the famous trail where the first English subtitled movie of Nepal- ‘CARAVAN’ was casted. 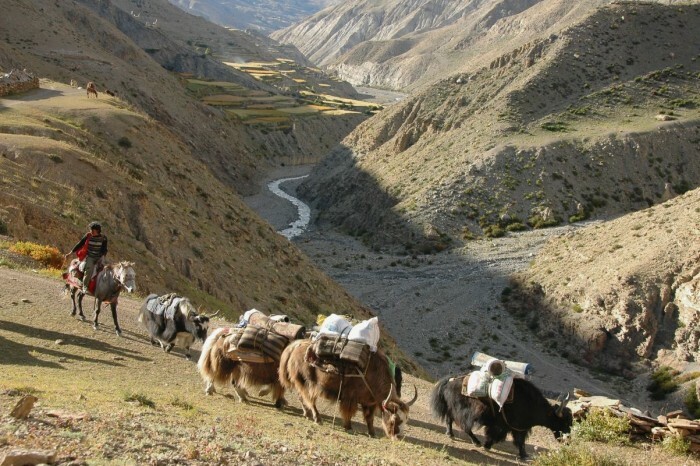 This trail is famous trading trail for the peoples of Dolpo and Tibetans. From the top, we can enjoy the breath stopping view of Lane Ringmo, the dark green pine forest and snowcapped mountain to the south. After some up and down we reach to the alpine area with the junipers called Thaneba or Lake side camp, a beautiful place for camping.Overnight stay here. Day 09: Trek from Sallaghari to Lar Tsa [4120m]: 6 hours walk. Today we will trek through a path having high stone walls on both sides and crossing a couple of streams.Then we will enter a narrow gorge where we set our camp for overnight stay. We can continue our trek but there might be altitude sickness problem. Overnight stay in Lar Tsa. Day 10: Trek to Shey Gompa [4320m]: 7-8 hours walk. Today we start by a long and strenuous climb of about 2 and half hour over a dusty path to Kang La (5350m). We will have quite difficult and adventurous trip ahead as we have to pass through a steep path covered with snow. After about 3 hours we will reach Shey Gompa, a small village with Gompa. 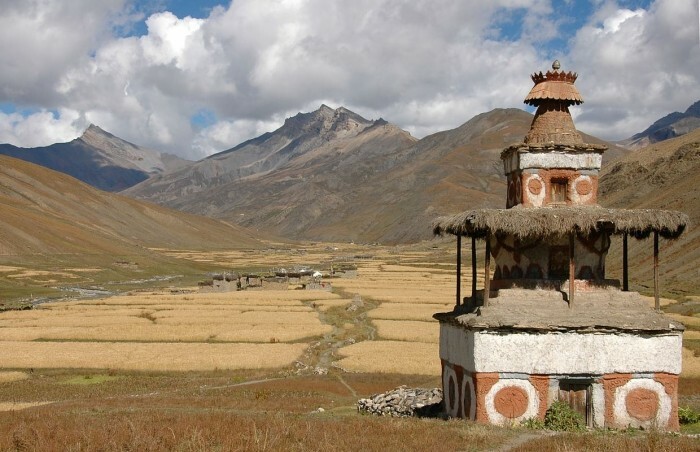 It is 11th Century Gompa situated beneath the crystal peak on a small grassy plain, built by a Tibetan Buddhist. Peoples have belief that the Tibetan Buddhist came here riding the flying lion. Every year many pilgrims visits this Gompa. Overnight Stay in Shey Gompa. We have walked many hours so today is our resting day. We can explore the Shey Gompa and Tsakang Gompa which is about 457m farther. Tsakang Gompa is not really a Monastery but a retreat. It had been a meditation center of Many famous lamas from Tibet. The Shey village is famous for its ancient Buddhist culture. It is said that Durutup Yeshe introduced Buddhism in Dolpo valley. We will learn about the Shey from with the help of locales and stay overnight in Shey valley. Day 12: Shey to Namgung [4430m]: 6 hours walk. We will pass Sheyla also called Gen La (5000m) to get to Namnung. We cans see the beautiful view of northern part of Tibetan plateau – ‘highest plateau in the world’ from the Glen pass. We can see Mustang on the east of Gen La. Descending the pastures we will reach to Namgung. Namnung is a beautiful village with friendly environment. Overnight stay in Namnung Village. Day 13: Trek from Namgung to Saldang [4046m]:6 hours walk. Our trek start with climbing a tree slope. We will ascend to 4700m before going dopwn steep slopes to Saldang village, situated on a plateau above the Nam Khong nala and the biggest village of lower Dolpo. The village lies in the trade route of Tibet. Overnight stay in Saldang. Day 14: Trek from Saldang to Sibu [4000m]: 6 hours walk. We will leave saldang village and pass through terraced fields, Stupas, Chortens, maniwalls and Chaiba monastery. We will pass through the Namdo village. After passing this village we reach to NamKhong Khola and finally Sibu. Overnight stay in Sibu. Day 15: Trek from Sibu to foot of Jengla. [4480m]: 4-5 hours walk. After leaving Sibu, we follow the line of the river valley and the trail is easy going initially. After four to five hours walk we will reach to the foot of Jengla where we will stay overnight. Day 16: Trek from Jengla to Tokyo Gaon [4240m]: 6-7 hours walk. Firstly we go through the Jeng La pass which is about 4850m. From the top of the peak we will have the great view of Dhaulagiri, beautiful glowing view in the morning. Then we will reach to Tarap village by the beautiful trail. After crossing the beautiful terraces we will reach to our today’s destination. Overnight stay in Tokyo Gaon. Today, we will pass through the maniwalls and Chortes. We can see some Chhortens in very poor condition. Dho Tarap is surrounded by irregular stone wall consisting thi9rty four houses. Both Bonpo and Buddhist people lives here with peace and unity. Overnight stay in Dho Tarap. Day 18: Trek from Dho Tarap to Serkam [3623m]: 7 hours walk. Our trail follows the course of Tarap Khola, generally downhill. We pass through the narrow gorges with the river rushing through. We have the chance to encounter blue sheep, marmots, yaks, sheep’s and goats and perhaps meet the people of Dolpo making their flocks of sheep and goat to lower pasture for winter. We can also see the steel suspension bridge used for passing the people and animals. Overnight stay in Serkam. Day 19: Trek from Serkam to Tarakot [2280m]: 5 hours walk. We leave Khanigaon by the new suspension bridge and walk alongside the river. Going uphill and downhill and crossing the vegetables and Marijuana fields we reach to the Tarakot Village. Before the Gorkha Dynasty, Tarakot was capital. There’s a famous Gompa 8km east from Tarakot. We will stay in Tarakot overnight. Day 20: Trek to Dunai [2109m]: 5 hours walk. The trail is mostly descending. Walking beside the Bheri River, we will use the indigenous path built twenty feet over the river. On reaching to Dunai, where we have camped before, we have completed the circuit. Overnight stay in Dunai. Day 21: Trek to Jupal [2404m]: 3 hours walk. Now wee retrace our steps to Jupal. Initially the trail is flat but the final hour up to our destination is steeper. Overnight stay in Jupal. Day 22: Flight to Kathmandu via. Nepalgunj. We will have early morning flight from Jupal to Neplgunj. We will enjoy the views of high mountains from plane. Then we will fly to Tribhuwan International Airport, Kathmandu. You can either can relax on Hotel or go for shopping in Kathmandu. Overnight stay in Kathmandu. Today, our adventurous trek to Upper Dolpo ends. Our representative will drop you to the Airport before 3 hours of our scheduled flight. We wish your safe journey with the hope to see you again!